Sometimes we aren't blessed with the perfect body. I, for sure, was one of those people. I've struggled with weight issues my entire life. I've been on the same diet roller coaster that most have been on, trying every fad diet and prescription pill imaginable. Although some seemed to work at first, it was always a temporary fix, leaving me going back, if not gaining more than where I was before. Then by what I call a blessing, I came across BeLiteWeight while searching the web one evening. 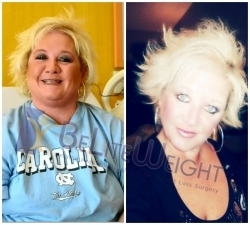 I'd always thought about getting a weight loss surgery procedure but like most, several things kept me a few steps away. There was first, the cost... second, the time away... and last, unknown of what to expect during such a procedure. The more I read about BeLiteWeight, the more comfortable and surprised I was about the information I read. Before I knew it, my flight was booked and I was on my way to one of the best decisions of my life. I was close to the heaviest weight of my life and at the age of 44, I knew along with the added weight, came much greater health risks. I didn't even have health insurance! But the staff at BeLiteWeight and all the information passed to me, had me at ease and ready to take that step. The communication was effortless and they answered every question I had. Several of their own staff were themselves, a client so their knowledge was first hand. With their help, I knew what to expect, about the facilities to chose from, the differences between the procedures that were available and the Doctors who would be working with me. They even had an awesome payment plan that allowed me to afford something I thought I never could. The pricing was thousands (yes, thousands) of dollars cheaper which made it even easier, to make my decision. I actually traveled alone and arriced at the airport on my scheduled day. As promised, a shuttle was there to meet me and a couple others and we were on our way. We arrived at the hospital, had an effortless check-in and taken to our rooms. I weighed in at 238 pounds the day before my surgery. Not a healthy weight, especially for a 5'2" frame! Within 3 days, I was back home! Surgery was fine, the doctors, Dr. Jose Rodriguez and Dr. Elmo Aramburo, were incredible, amazing bedside manners and a very nice, clean facility. I am happy to say today, that I am about 20 pounds from my goal weight. I am now almost below 170 pounds* and continue to lose monthly. I feel so much better, am more active and happier... and know, without a doubt, that I have BeLiteWeight to thank for that. THANK YOU BELITEWEIGHT FOR MY NEW ME!! !